As the lubricant for the moving parts of your engine, motor oil is widely considered to be the most important fluid you can use. It prevents excessive engine wear and tear, which makes it vital to keep your car running. 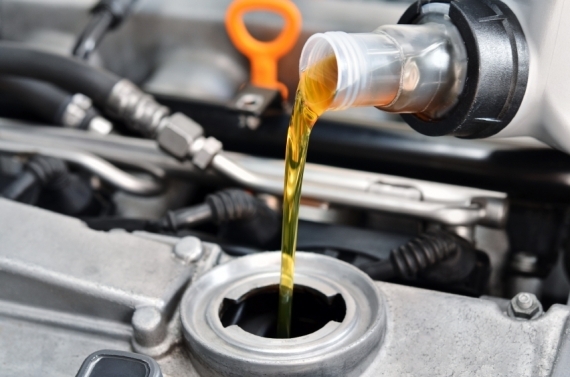 So when the time comes to get under the hood to do an oil change, you can bet you’ll want to know whether to buy synthetic or conventional oil. There are three main types of oil: conventional, synthetic and synthetic blend. Conventional oil is organic—it’s essentially refined crude oil that’s been pumped up from the ground. Synthetic oil is the fake stuff—it’s manufactured molecule by molecule, and because of that, synthetics have fewer imperfections in their chemical buildup than conventional does. Synthetic oil works better in extreme temperatures from below freezing to above 100 degrees Fahrenheit. Conventional oil is highly reactive to temperatures. Because synthetics have superior lubrication (they’re more slippery), they give you better fuel economy, performance, and even a longer engine life. And best of all, synthetics don’t have to be changed as often. But make sure you meet warranty service mileage intervals regardless. The only downside to synthetic oil is it costs more than the regular stuff. But before you choose pennies over performance, crunch the numbers—with longer oil change intervals, the price difference might be a wash. Synthetic blends, or “semi-synthetics”, add synthetic additives to conventional oil and can be a nice compromise between the two. They’re less expensive but provide some of the performance enhancement you get from a synthetic. These three types of motor oil will work fine in your vehicle as long as they meet current American Petroleum Institute (API) certification and don’t go against the manufacturer’s recommendations. The only type of engine you should never use synthetic oil in is a rotary. Rotary engines have unique seals that are engineered for use with conventional oil only. Pro Tip: Check that you’re not voiding your warranty by using the wrong oil. Many newer vehicles require that you use synthetic oil, and some synthetics aren’t approved for certain diesel engines. When buying oil for your car, the best thing you can do is to follow your manufacturer’s recommendations. So, check that owner’s manual! When you consider that the wrong oil can cause an engine to fail, it pays to take their suggestions seriously. If you have the option to choose between synthetic and conventional and still aren’t sure which to pick, consult a pro—they’ll know what to do. I am using Synthetic oil. Thank you for your tips its help to know the best information for synthetic oil. Please continue your article.